As Quality grows as a company, we continue to look for ways to improve the overall healthcare and patient experience. 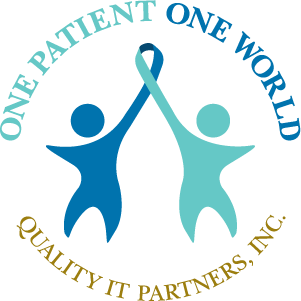 In 2011, we launched our philanthropic program, One Patient One World. This program is designed to assist in forging new relationships between organizations and patients. In November 2011, Quality reached out to the Taussig Cancer Institute at the Cleveland Clinic Foundation to connect Quality with a patient within their 4th Angel Mentoring Program. We wanted to provide a patient with an evening of joy, and to foster a long-term supportive relationship with this person throughout their journey. Quality was honored to meet its newly sponsored patient, Mrs. Antoinette “Toni” Turchi. Toni was diagnosed with triple negative breast cancer, a very aggressive type of cancer, in March of 2011. In keeping with our goal, Quality invited Mrs. Turchi, her family and two Cleveland Clinic executives to join us as our guests at the 2011 Scott Hamilton CARES Ice Show and Gala. When the invitation was extended, Mrs. Turchi had only four remaining treatments. She was thrilled and couldn’t think of a better way to celebrate the gift of life and, most importantly, the cause Quality was supporting. That night, Quality and Cleveland Clinic executives sat with the Turchi’s in the VIP section and listened to Grammy award winner Sheryl Crow sing as world champion ice skaters performed. Then it was off to the Renaissance Cleveland Hotel for dinner and dancing until late in the evening. “It was a magical evening, and we were treated like royalty,” Mrs. Turchi says about the event. “Spending quality time with my family is so precious. And we have gained so much more than just seats at an ice show – we have gained true friends.” Mr. Debnam adds, “We wanted the Turchi family to have an evening to remember. We consider them as part of our extended family, and we continue to stay close in touch.” A new lifelong friendship was forged. Attending the event has also inspired the Turchi’s. They are dedicated to supporting Cleveland Clinic researcher, Vincent Tuohy, Ph.D., and his development of a breast cancer vaccine. The Turchi’s are already planning to attend the 2012 ice show and gala and are encouraging friends and relatives to purchase tables as well. “It may sound funny, but getting cancer is probably one of the best things that has happened in my life,” says Mrs. Turchi. To partner organizations with patients fighting life-changing illnesses to enrich their lives through unique supportive relationships. In addition, to promote opportunities to increase funding for healthcare organizations, in support of finding new cures for life changing illnesses.